I know I am a day early, but I have to work tomorrow so I figured I better get an early start on your letter. This letter-writing thing is something I really want to keep up with. I know that I get long winded sometimes, but I want to be able to remember these things when I am old and when I am long gone, I want you to have these to remember me by. 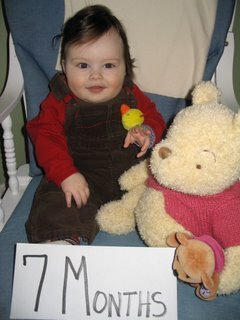 Seven month statistics: Weight: 22 lbs. Length: ? inches. Diaper Size: 4 Clothes: 12 months. With all the holiday fanfare complete and you starting solids, your sleep is back to a nice regular schedule. Typically we start the bedtime routine about 6:45pm. Every other night your dad gives you a bath, then clean diaper, pajamas, stories and then nursing. You are usually asleep by 7:30pm. During the past month we have had several nights where you slept from 7:30pm – 6:30 or sometimes even 7:30am. Unfortunately, it seemed that you would wake up earlier and earlier and now you are waking up around 5 or 5:30am. It is very difficult to get you to go back to sleep. It is also hard on the days that I work because I am not sure if I should wake you up and try to feed you at 4:30am, or just jet you wake for the day at 5:30am. Seems like everyday is different. On days that I am home you are a great napper. As I mentioned last month, we read Healthy Sleep Habits, Happy Child. After you are awake for two hours, we put you down for a nap. This works well for the first two naps. The third one around 4pm is where we struggle. You also don’t seem to like to nap at daycare very much. Personally I think she just has her hands too full to be reading your sleepy cues. We didn’t make it to Boston last month for your dad’s birthday because he was very sick. I’m still sad that we didn’t get to go. I was really looking forward to hanging out with Karrie and gleaning some sage mom advice from her. We are talking about planning another trip later in the year. Speaking of trips, we made our reservations for a beach house this summer. In August we are going to spend a week at the Outer Banks. We have never been before, but it sure sounds like fun! We will be in a condo that is 500 feet from the beach and it has a pool and is close to many restaurants and shops! Fun! This past month has been filled with so many new things for you – sitting up on your own, eating solid foods and actively playing with toys. You were just starting to sit up on your own last month, but now you are a pro! I still put the Boppy behind you for the occasional topple over, but your dad sits you up just about anywhere. You still use your feet to push your toys away. I think you are still getting the hang of how to use them. January 27, 2006, you ate solid food for the first time (well except for that pickle). We gave you a little dish of baby rice cereal and you loved it! Every week we had a new food to the rotation. You are currently enjoying cereal, bananas, avocado and sweet potato. This week we will start peas! Sometimes you make a sour little face when trying something new, but after a few bites you are on board. So far, we are making your food except for the rice cereal. The banana and avocado were really easy. We just mashed them up for you. The sweet potato we cooked in the microwave and put in the small food processor. We then make little ice cubes with the food and freeze. Once they are hard we place in a plastic bag. Then at each mealtime we just grab a cube or two! Very easy. I also like knowing exactly what you are eating in case we run into any allergies. So far, so good! I know that I write a letter to you every four weeks, but the dramatic change in your motor skills over the past four weeks is amazing! We spread out a blanket on the floor and give you some toys. You will sit up and play, passing toys from one hand to the other, tasting everything and smiling and talking to yourself. When you are in your rolling chair, you now move your feet in a concentrated effort to chase the dog and you look for your toys that you have thrown off the sides onto the floor below. If we leave you on your back or tummy on the floor, you can now roll both ways. It is just so cool how aware of your surroundings you are. Last night we moved you from the sink to the regular bathtub for tub time. You still sit in your baby tub, but you were making such a mess in the kitchen, we didn’t have a choice. You have learned how to splash. You kick your feet and now your arms like mad! It is adorable, but the kitchen was twice like a swampland after bath time. Your dad was also soaked to the bone! Hee hee. This afternoon Jacob and Alana came over for lunch. You were so vocal! You happily sat on the floor and were talking up a storm. You love to laugh! Your dad will say, “Vrooom, vroom, vrooooom!” You totally crack up. You are such a happy baby! He also likes to sneak up on you like a tiger. He smile and giggle at him with glee! In April we will be heading back to Las Vegas for Easter. I hope you sleep better while we are there than you did at Christmas. I wonder if you will be crawling by then? I’m not in any rush! We are just enjoying every single day with you just as you are.